Most leadership books focus on traditional leadership, which is based on managerial practices and command-and-control assumptions. Traditional leadership methods produce short-term gains but often at the cost of employee disengagement, team isolation, and distrust. Twenty-first century leadership methods produce short-term gains while inspiring creativity and innovation and boosting engagement. Nine Practices of 21st Century Leadership: A Guide for Inspiring Creativity, Innovation, and Engagement describes nine leadership practices that Gary DePaul derived by analyzing some of the best contemporary writers and thinkers on leadership. Explaining the nine practices, DePaul summarizes insightful leadership principles, beliefs, and practices, which includes tactics, tools, and resources that anyone at any career level can immediately begin using. In addition, the book demystifies the leadership concept, helps you avoid harmful traditional leadership assumptions, provides a leadership development roadmap, and presents real-world examples of how individual contributors, managers, and executives, have applied each of the nine practices successfully. After reading this book, you will be able to begin applying the nine proven leadership practices immediately in your organization. You will gain the skills needed to improve organizational strategies, diversity strategies, and leadership development training in your organization. You also will be able to improve how you manage and monitor your own professional leadership development. 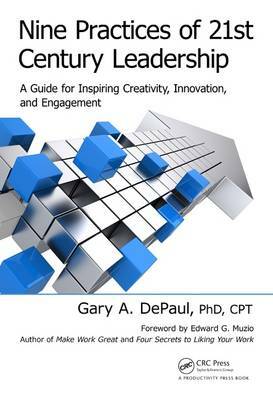 "Gary DePaul's comprehensive Nine Practices of 21st Century Leadership makes sense of the vast sea of leadership books. Written with both managers and scholars in mind, DePaul's study situates-and demystifies-the language of leadership in systems thinking. In 15 well-organized and lucidly written chapters, the author builds a series of metaphors to explain the practices of expert managers-analyzing, detecting, guiding, nurturing and more. This book will change your thinking about leadership." "Gary has saved anyone with an interest in the topic of leadership a tremendous amount of legwork and created an incredible resource for leadership growth. The meta-analysis approach allows us to readily see patterns among leadership thought leaders and distills them into nine essential 21st century leadership practices. Most importantly, the rich assortment of examples, practices, and recommended actions provided are a tremendous asset to our development and growth as leaders. A note of caution: be prepared to see yourself and your own leadership assumptions and practices challenged (in a good way)." "In Nine Practices of 21st Century Leadership, Gary DePaul weaves together and builds on some of the best current writers and thinkers on leadership. The nine practices - leadership in action - are challenging, but Dr. DePaul makes them eminently approachable. Trying even a few of the practices can strengthen your leadership qualities, capabilities, and behaviors. There is insight and practical advice for all levels of an organization, from individual contributors to the CEO." -Don Kirkey, Ed.D., Director, Leadership Development, Lowe's Companies, Inc.
"Transitioning from traditional to 21st century leadership is a must. This book gives you the tools to achieve such a goal by analyzing, diagnosing, directing, nurturing, exposing, facing, developing, and communicating the elements that enhance the mental and moral qualities, as well as the capabilities and behaviors. Practicing this leadership approach ultimately improves personal and team performance, especially when Command and Control is shifted from a traditional leader to a shared-team function." "All too often people are put into supervisor, manager, or leader positions because they are excellent engineers, accountants, or sales people. Most are not prepared for those positions in any systematic way. This book provides a roadmap for developing leadership practices within seven suggested underlying principles. The grids for aligning practices with the suggested principles and beliefs will be of particular value to the newly promoted, inexperienced manager or leader." -Margo Murray, MBA, CPT, C-EI, President & Chief Operating Officer, MMHA The Managers' Mentors, Inc.
"Gary has done an excellent job of reframing leadership with his emphasis on practices versus traits or qualities. Gary's approach provides a deeper understanding of what constitutes leadership compared to what has been done in the past. The book will be an invaluable resource. Every learning and human resource professional can use this book to better ensure their programs focus on practices that contribute to sustainable gains in human capital." "In Nine Practices of 21st Century Leadership Gary DePaul provides a Performance Improvement view of leadership practices. Part one demystifies leadership. Part two introduces the nine practices of leadership from a performance improvement viewpoint. These include: focus on results, take a systematic approach, add value, and partner. Throughout, Gary draws on his experiences as a Performance Improvement professional. A good choice to add to your performance improvement library." "The Nine Practices of 21st Century Leadership removes the mystery and provides much needed shortcuts to deciphering the wide range of current leadership techniques and philosophies. It is a fantastic tool to help both new and successful leaders build and expand their repertoire and target the areas they want to explore further. A must read, and the foundation of every professional library, Dr. DePaul provides a fantastic starting point with lots of helpful tips and best practices." "In my work with the TLS continuum as discussed in our `Achieving HR Excellence through Six Sigma', we discuss the need to convert managers into leaders as a critical requirement to implement the procedures we discuss. Gary DePaul's new book provides a precise roadmap for that journey which can be followed by anyone in a leadership role." "Gary DePaul's does a masterful job of highlighting best practices for those interested in boosting their leadership skills. The chapter, `Facing the Unknown Like Lions', is a great reminder of the importance of staying in the moment and listening to your mind and heart before taking action." "In his new book, Dr DePaul provides a helpful combination of tactics, tools, and resources for leaders at every level. It's a handy, accessible, and easy-to-use guide for everyone interested in expanding his or her leadership capabilities."